Anthony Joshua is eager to fight Tyson Fury sometime in 2015 and his promoter Eddie Hearns has already stated the interest in Fury fight for the upcoming summer. 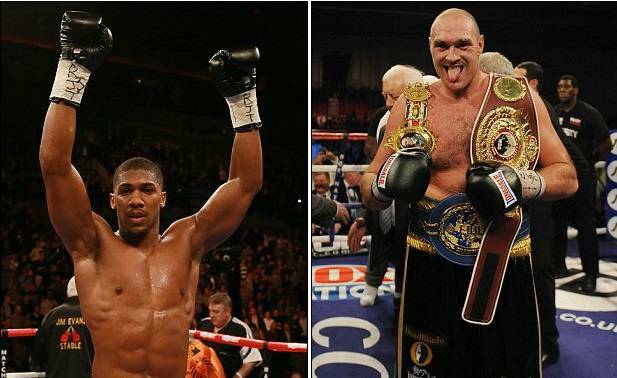 If it were to happen it could turn out to be the biggest heavyweight fight in recent british boxing history. Anthony Joshua has started his professional boxing career in heavyweight division with some great performances, although just into his 10 pro fights he has not faced any top rated fighter but come next summer in 2015 he might be able to watch him box against one of the best heavyweights from United Kingdom in Tyson Fury who recently defeated Dereck Chisora. Anthony Joshua will be announcing his next fight against american heavyweight Kevin Johnson which is likely to take place in London’s O2 arena on January 31st and he is eager to move onto next level after that fight. His promoter Eddie Hearns has already started the talk of the fight against Fury which might take place in summer of 2015. Tyson Fury on the other hand has just beaten Chisora in the rematch and he is the mandatory fighter for the WBO Heavyweight championship fight against Ukrainian legend Wladimir Klitschko. Its remain to be see whether Klitschko will honor the mandatory status. Tyson Fury also challenged Anthony Joshua on twitter as he wants to fight more frequently and to stay busy avoiding the mistakes he made in the last couple of years where his planned fights with David Haye got canceled.